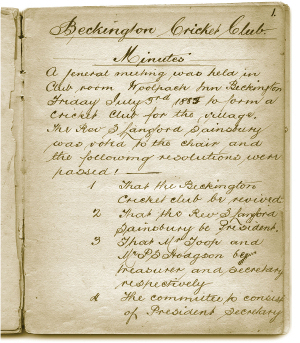 Beckington is amongst the oldest surviving cricket clubs in the county with records dating back as far as 1884, and held in the possession of the club is an actual scorebook from that year. Amazingly there were 77 members and players at the first meeting and our records show many names from those early pioneering days still exist in and around the village to this date (Fussell, Heywood, Hillman, Humphries, Joyce, Keevil, Millett, Moon, Perrett, Phillips, Pickford, Porch, Prichard, Randall, Rose, Sadler, Toop, Veysey, Webley, Wilbraham, Yerbury and many more). Indeed by coincidence or fate, the club is currently chaired by Alex Keevil. He and his brother Ben both currently play for the club and their great grandfather was one of the founding members of 1884. This family have become synonomous with Beckington Cricket Club, as every generation of the Keevil family has captained the Beckington side at some time in its history. The first year saw six matches but this rose to 18 in the following year and increased steadily over the years. Matches were played against the local opposition of Berkley, Buckland, Chapmanslade, Farleigh, Freshford, Frome, North Bradley, Norton St Philip, Nunney, Orchardleigh, Rode and Wingfield. Even in those days the results suggest Beckington had a successful team with many more victories recorded than losses. 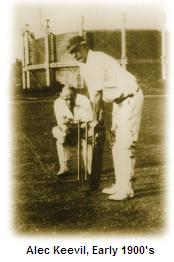 In the early years teams were often bowled out for less than 50 and matches often comprised of two innings per side. It is worth noting that playing conditions made run scoring very hard; for an individual to score 20 runs was some feat. However, Beckington didn't seem short of practice as they trained four evenings a week! Originally the club rented a field in the middle of Beckington from Mr Toop and some years later Mr Webb. However this was only ever temporary and a permanent home for the club was sought. Finally things got so bad that in 1926 due to no field being available play was abandoned for a season. However, following a sizable donation from the Club towards providing a recreation field for the village, a new home for the club was found and The Beckington Recreational Ground became, and still is, Beckington Cricket Club's home. 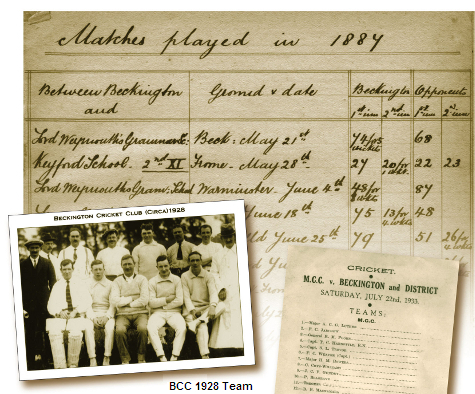 The team put on a showcase match in 1933 when Beckington played host to a very strong MCC X1 in what was a closely contested match where the visitors ran out marginal winners. Incidentally, Beckington had the honour of being the first village side to host the MCC since 1921 and a crowd of over 300 was present. The cricket club continued to flourish through the next four decades playing solely "friendly" cricket. Unfortunately there are very few records for the club over this period. The 70's and early 80's saw Beckington compete very successfully in the Bass Charington League, which it won a number of times, making the competition its own. Such names as Perrett, Harrison, Keevil, Collier, Reynolds, Peters, Trim, Joyce, Rustell and Skyrme regularly hit the local sports headlines in what was a very strong period for this village club. 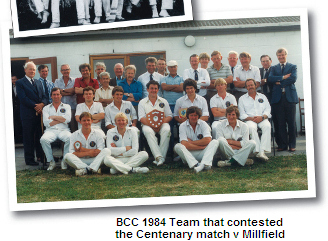 In 1984, to celebrate their centenary, a match was played against a Millfield X1 which saw the Beckington side triumph in a well supported event. 1986 saw Beckington's introduction to the North Somerset Cricket League. Beckington rose through the ranks from the old Division 6 in quick-smart time gaining promotion nearly every year, and soon found itself in the top division, where the club remained until 2006. During this period Beckington won the League knock out cup on three occasions and reached the semi- finals on it's only entry in the prestigious Somerset cup. With the death of long time stalwart Brian Keevil in 1996 the club was rocked and soon discovered just how hard Brian had worked on its behalf. He had more or less run the club for the past 3 decades and it was apparent that the club had to pull together to fill his boots the best they could. Over the next few seasons BCC survived but it wasn't until 2003 with renewed enthusiasm from the committee that Beckington CC decided to set about strengthening the club in terms of equipment, players and members. Fund raisers such as clay shoots, bingos and golf competitions proved tremendously successful and provided a much needed boost to club funds. 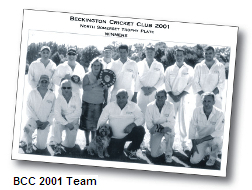 Local sponsors generously supported the club and in 2004 Beckington fielded their first official overseas player. In 2006 it was unanimously decided to move leagues from the North Somerset League to the Wiltshire League. This decision was 3 fold. Firstly the North Somerset league had become stale with no promotion from the top flight teams who tended to play each other year in and year out. Umpiring standards were inconsistent and for many players much of the enjoyment of playing cricket was fading. Secondly, playing in such a competitive environment had restricted the development of players, with the result that crucial opportunities didn't arise to allow people who didn't normally bat or bowl to have the chance. The Wiltshire league points system presented the opportunity to give players the chance to perform during competitive matches. Although BCC 's aim is to succeed in terms of results on the pitch, they must also develop their players, giving people opportunities to once again enjoy playing the game of cricket. Thirdly, the Wiltshire league has a far superior structure to the North Somerset League as it allow teams who win their first division the opportunity to enter a premier league that combines the cream of both Gloucestershire and Wiltshire. BCC feel this was a landmark move and one that will secure the survival and development of Beckington Cricket Club. Their long term goal is to produce a strong 1st XI who play as high a standard as possible, a 2nd XI playing weekend league cricket and a friendly/social XI who play midweek. Since their introduction to the Wilts League, BCC have gained promotion into Division 3 and narrowly missed out on promotion into Division 2 last year. The club has more players than ever in their recent history and now run a midweek friendly team as well as the competitive league team. They aim to dramatically improve the playing facilities of the club over the next 3 years and hope to incorporate a youth development programme in the very near future. 2010 sees the club in a much stronger position financially and with a club constitution to help provide the club with a rigid framework to work to.